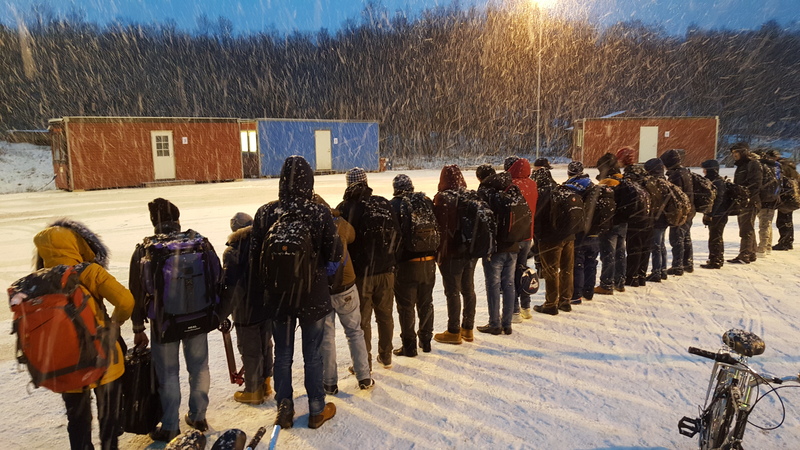 Immigration officials are working outdoor in snowy, cold weather and in barracks with open doors, but a government appointed expert group says there is no urgent need for new facilities at Storskog. The police, the Parliament’s Standing Committee on Foreign Affairs, the Government itself; they have all highlighted the need for building a brand new border checkpoint at Storskog. Since the current building was erected two decades ago, traffic has increased sharply. And now, the inflow of migrants has brought Storskog to the brink of collapse. Three barracks are urgently brought in together with tents set up by the Norwegian Civil Defence. More than 3,800 migrants from more than 20 different nations have entered Norway by coming the so-called Arctic Route via Murmansk. It is the regional newspaper Finnmarken that brings the news about the stand-by approach from the expert group that delivered its 140 pages report on the issue to Norway’s Ministry of Justice and Public Security on September 30th. There are uncertainties about what Russia will do with its checkpoint at Borisoglebsk that is the main arguments for why Norway should await reconstruction of the border checkpoint, according to the report. A brand new checkpoint, as the Parliament’s Standing Committee on Foreign Affairs asked for in 2012 is not even on the agenda. “It is inappropriate to establish a Norwegian capacity that is bigger than the on planned on the Russian side, but it is neither said the Norwegian capacity necessarily have to be as big as this,” the reports says according to Finnmarken. Some measures are, however, recommended now according to the report. It suggests NOK 3,1 million (€335,000) should be spent on a new gate and move some of the fences at the current facility.